The Digital Research Library of Illinois History Journal™: Camp Skokie Valley & U.S. Camp Skokie were located in Harms Woods at the east outskirts of Glenview, Illinois. Camp Skokie Valley & U.S. Camp Skokie were located in Harms Woods at the east outskirts of Glenview, Illinois. 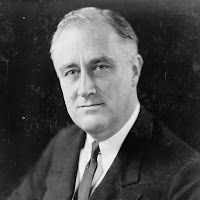 One month after taking office, President Roosevelt (FDR), inspired by his experiences with Progressive Era conservation in upstate New York as well as his involvement with the Boy Scouts, initiated the Civilian Conservation Corps (CCC), a New Deal project. The Department of Labor organized the enlistment process, accepting men between ages 18 and 25, later expanded to 17 to 28, whose families were on the relief rolls. Enrollees were paid $30 per month, $25 of which went back to their families. Most of the work would be done on government-owned land and supervised by the Department of Interior or the Forest Service. CCC enrollees worked on a variety of projects on public lands throughout the nation, including fighting forest fires, building roads and trails, improving recreational facilities, planting trees, and completing erosion and flood control projects. A fleet of 40 trucks transported enrollees to the job site in the morning and brought them back to camp for lunch and in the evening, 1935. In May 1933, FDR approved eight CCC projects in Illinois, one of which was the Skokie Marsh project. The purpose of the Skokie Marsh project was two-fold: to drain the areas swamp-like land and to create a recreational facility. Camp Skokie Valley, established a month later on June 27, 1933, began as a tent camp near the marsh along Willow Road. But when the owners of the property requested a rental fee, the CCC decamped to county-owned land on Harms Road south of Glenview Road. 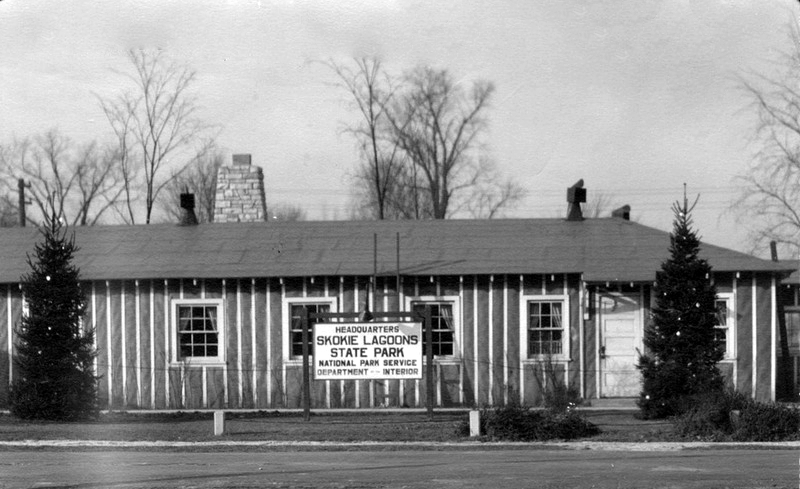 Camp Skokie Valley Headquarters, 1938. In September 1933, workers began constructing the permanent structures of Camp Skokie Valley. More than 1,000 men, organized into five companies, descended on the marsh to begin transforming it into the Skokie Lagoons. 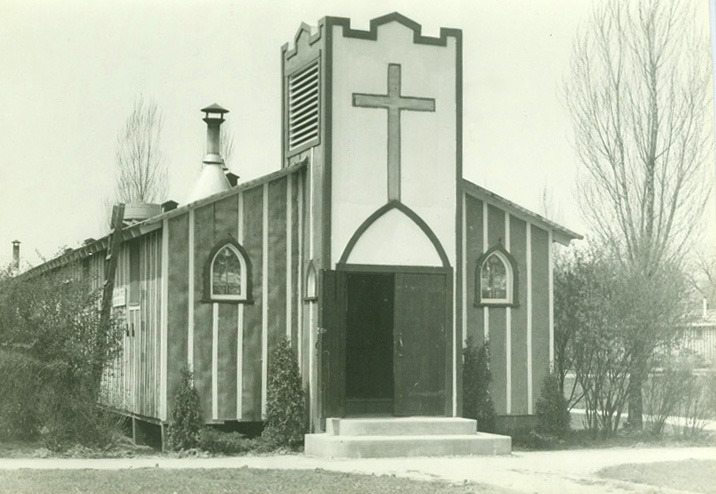 Camp Skokie Valley Chapel, 1941. Ultimately, the camp consisted of 115 buildings, including barracks for more than 2,000 men, mess halls, kitchens, a chapel, a barbershop, canteens, and classrooms. 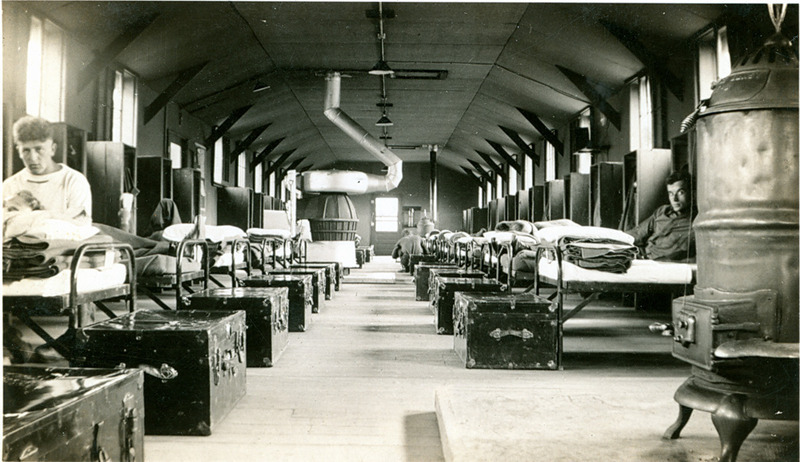 Inside the barracks at Camp Skokie Valley, 1935. The Army ran the camps where the enrollees lived, and provided them with food, clothing, and medical care including three physicians and a chaplain. Military officers from Ft. Sheridan were in charge. The men wore World War I-style unadorned olive uniforms for dress occasions and denim work clothes on the job. 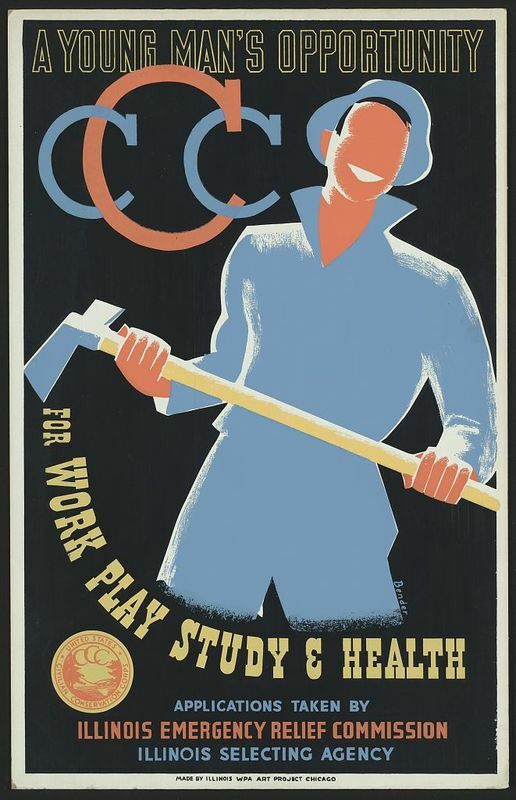 Despite a clause prohibiting racial discrimination in the law that created the CCC, the organization adopted a national policy of racial segregation in its camps. Camp Skokie Valley included two companies of African American enrollees. Members of Co. 605 are pictured here, 1939. Although CCC camps were under the jurisdiction of the National Park Service, they were administered by the War Department. Since the Army ran the camps, life was very regimented. 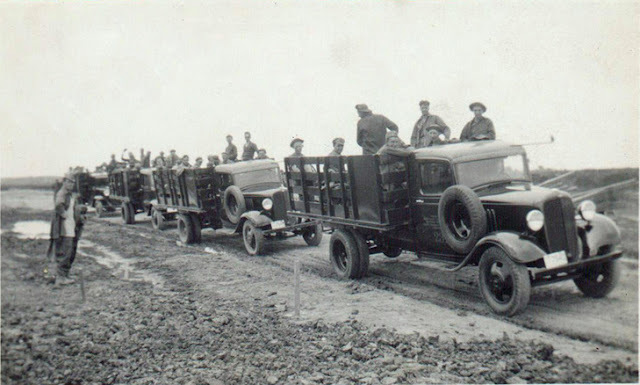 Enrollees at Camp Skokie Valley worked in three shifts, with the first truck leaving camp for the job site at 6:30 a.m. and the last truck returning to the camp at 4:50 p.m. The men worked about seven hours per day, five days a week. Enrollees found many ways to amuse themselves when not working in the lagoons, including organizing musical performances. During their free time, many enrollees attended evening classes at the camp on a variety of academic and vocational topics. Organized sports were also very popular, with inter-company games and competitions held in basketball, baseball, volleyball, and boxing. Volleyball (pictured) and other organized sports were encouraged by CCC leaders and enjoyed by the enrollees. 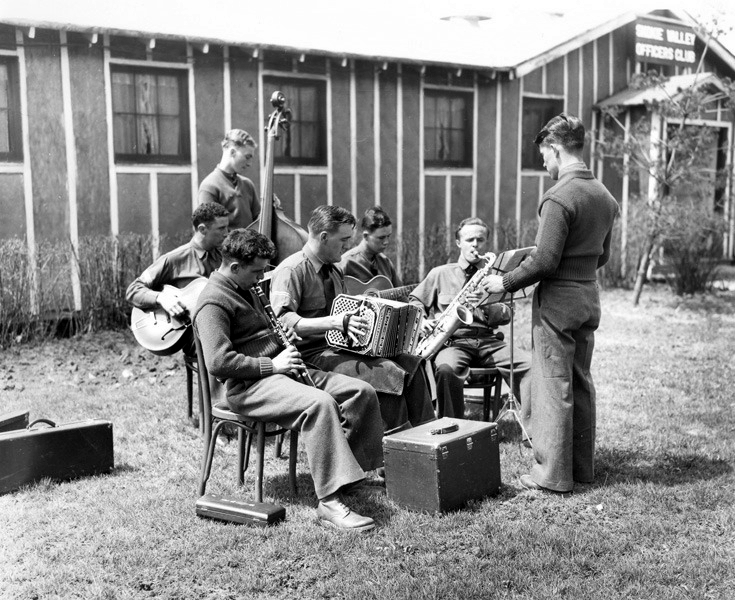 By the time the camp was phased out in 1941, thousands of young men from across the country spent up to two years at Camp Skokie Valley from 1933 until through 1941. The buildings stood vacant for a couple of years, when the camp was reactivated in 1943 to house the 740th Military Police Battalion. Initially, the Battalions mission involved public relations and recruiting. They participated in numerous parades and war bond fundraisers in Chicago. In addition, they served as body guards for Hollywood celebrities who were in town to help promote bond drives. The 30-member 740th Military Police Band frequently participated in radio broadcasts as well as in concerts in Chicago's Grant Park. As World War II progressed, facilities were need for German prisoners of war. 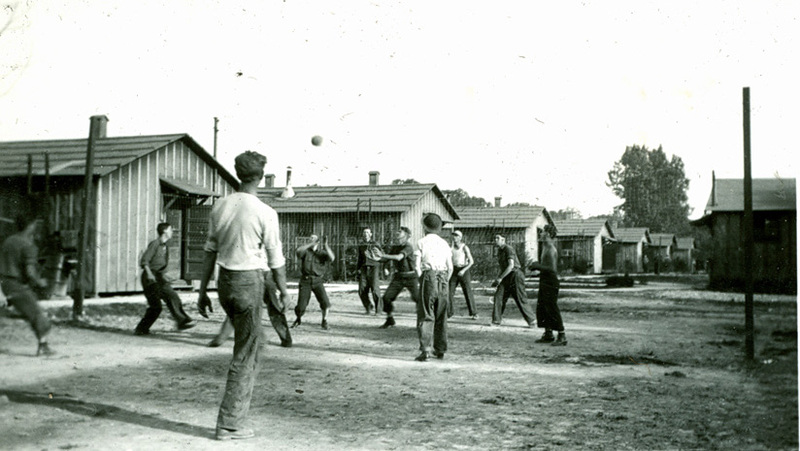 These prisoners were incarcerated in the U.S. Camp Skokie, one of many among the former CCC camps in this country to be pressed into service to fill this need. POWs at Glenview were primarily Luftwaffe air crews along with troops of General Field Marshall Erwin Rommels Afrika Corps. The POWs were treated well and generally content with their situation in Glenview. They were put to work on surrounding farms and orchards. This arrangement worked out well, since many of the property owners were themselves of German extraction and could converse with the prisoners in their own language. Being in one of these POW camps was very little like being in prison or a concentration camp. Many of the prisoners blended with the local community, drinking at bars and dating local women. Some POWs worked at the Glenview Naval Air Station, including a contingent who were said to have helped build the Navy chapel (now owned by the Glenview Park District and located in the Glen). Nearly 400 POWs were based at U.S. Camp Skokie in 1943. When World War II finally came to an end in 1945, there was no further use for the facility, and it stood vacant for nearly 20 years. Most of the old barracks and other buildings were demolished. However, one barrack building was preserved and renovated in the mid-1960s to establish Girl Scout Camp Adahi which has been razed in 2016. Some concrete foundations and steps are all that remain of the rest of the camp that once played an important role in Glenview's history.